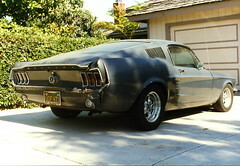 Our 1967 Mustang has been in storage for nearly 15 years because we could not decide what to do with it since the kids got done driving it to High School. Well, the recent call to use it in a music video “How Far Do You Want To Go” for Gloriana got us excited about getting it back on the road on a regular basis. With the coming of spring we decided it was time to make it road worthy. Since the video called for a fixer upper fastback our Project Car fit right in. To keep that image alive and to fit in with the new Rat Rod craze as well as our limited budget, the improvements will be kept to those necessary to make the car safe and dependable. However, we will also be paying attention to the aesthetics as long as our budget provides for it. Obviously, the car runs and drives very well but everything is old. The hoses are dry and brittle, the tires are rotted and there are some dents that just have to be fixed. As for the interior, it is much to dirty and ragged to use as is. We will be replacing all of the vacuum lines, pressure lines, fuel lines, brake lines, putting in a new gas tank and putting new tires on the fastback. We will also be hanging some new front and rear bumpers and lower pans. As for the interior, it will get improvements but we we decide on that at another time. The body will remain in its faded gray paint with spotted primer where it is needed. The car has absolutely no rust and is lowered two inches all around. It is a 289 with a four barrel and automatic. The power disc brakes, power steering and factory air will all be working. These are all easy fixes and there should be no problem having it ready for one of the first cruises this spring. We have started some of the restoration work on the Mustang’s old collision damage on the right rear. Click Here to follow the restoration process. marc, I have owned the car for nealy 25 years and it is part of the family and not for sale. Thanks for visiting the site.